My step-mother Lyllis was a caterer in New York. I have used a lot of her recipes over the years. This easy to make salad was always a hit when she catered. I now use it when we have cookouts and have friends who ask me to make sure its on my menu. I buy baby organic spinach leaves which makes this salad even easier to prepare. Combine the above ingredients and shake well. (I use a small jar). 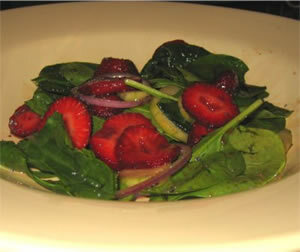 Pour 1/4 of the dressing over the spinach and strawberries just before serving. Dressing keeps 2-3 days in fridge. *Some people like to add thinly sliced red onions or/and English cucumbers to this salad.